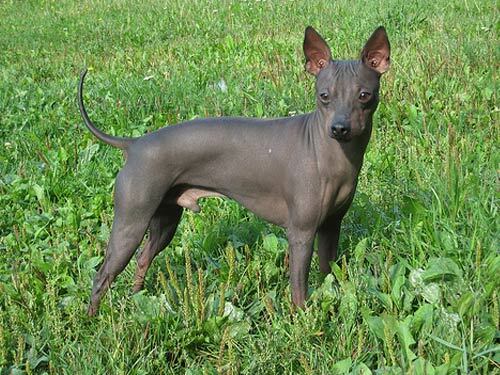 Breed Group: Not Akc Recognized Weight: 5-16 lbs Height: 7-16 inches Developed during the 1970s by breeder Edwin Scott, the American Hairless Terrier descended by chance from purebred, coated Rat Terriers. With the awareness of allergy sufferers to this unique breed they become popular in the United States and such countries as England, Finland, and Canada. American Hairless Terrier's are the first Hairless breed to have originated in the United States. Small to medium in size, the American Hairless Terrier is agile, active, and smoothly muscled. They are elegant, compact, exhibit a confident appearance, and have an inquisitive expression. Affectionate, playful, and loving, the American Hairless Terrier is also fearless and fiesty. They do best with older, considerate children or children they have been with since puppyhood. They do well with dogs, cats, and other household pets. The American Hairless Terrier breed is typically very social and friendly with strangers but can also be territorial. They make good watchdogs as they will bark to alert their family to visitors and out of the ordinary sounds. Coat The American Hairless Terrier comes in two different varieties: Hairless and Coated. In the Hairless variety puppies are born with a fine, soft "down" that diminishes by the age of 8 weeks leaving the puppy hairless. In the Coated variety the coat is dense, short, smooth, and sleek. The American Hairless Terrier is easily trained. Early socialization and obedience are recommended. They will not respond to harsh or heavy-handed methods. Training must be done with firmness, fairness, patience, and consistency. The American Hairless Terrier breed is active indoors and is generally suited for city and apartment living. Ideally, a small or medium-sized securely fenced yard is best as the American Hairless Terrier thrives on off-lead play.